In recent weeks, a dozen women have come forward alleging that presidential nominee Donald J. Trump made unwanted sexual advances on them. Each of these accusers has operated, seemingly in collusion, with the sole intention of spreading outrageous falsehoods to undermine a man of great esteem and resources. Not only has this rank slander dealt a grievous blow to Mr. Trump’s reputation, but the words of these women have stained America’s legacy of fair and respectable electoral politics, and we at this newspaper can no longer stand idly by while such brazen and criminal defamation goes unpunished. It is with this in mind that the editorial board of The Onion has unanimously voted, with all due humility, to offer up our offices to imprison the women who have wrongfully assailed Mr. Trump’s honor and good name. We urge the public to recall that Mr. Trump is not only a globally successful businessman with a net worth in the billions of dollars, but also an aspirant to this nation’s highest office. As such, these accusations—all of them libelous and wildly defamatory—stand to profoundly erode his stature in the public eye at this critical juncture in the election cycle, which is why those responsible must be made an example of. Moving with all due haste to incarcerate these women within The Onion’s detention cells would, in our opinion, put a swift and resounding end to their present smear campaign and further act to dissuade future maligners from coming forward. Indeed, even if Mr. Trump did commit an act or two of those which he has been accused, shouldn’t his immense prestige give him license to make a mistake here or there without it tarnishing his character and jeopardizing his chances at elected office? The editorial board of this newspaper has taken the liberty of readying a private security unit to find these women wherever they may be hiding, apprehend them with all necessary force, and remove them from the society that they, through their cowardly actions, have forfeited their right to be a part of. We ask only for the assent of Mr. Trump himself. We recognize that the Trump campaign may have questions about The Onion’s prison facilities and whether the conditions within them will be sufficiently isolating and punitive in light of the egregious character assaults these women have leveled against the Republican candidate. The editors of this newspaper would like to assure Mr. Trump and his staff that The Onion takes incarceration very seriously. Indeed, our detainment complex is recognized as one of the world’s premier black sites for extraordinary rendition by many foreign intelligence agencies, and we presently confine hundreds of dissidents and activists on behalf of our government partners in North Korea, Saudi Arabia, Myanmar, and elsewhere. Each woman will be housed in one of the 1,500 detainment chambers situated in 12 tiers between floors 92 and 104 of our office tower, likely in cell blocks 1-B or 3-F, which have been newly vacated following recent liquidation orders from the Chinese Standing Committee. Like all of our cells, theirs will be constructed of double-fortified concrete and lack any windows or discernible entryways, ensuring these women will have no possible contact with the outside world to further disparage Mr. Trump. Our professional prison staff, consisting of 156 Revolutionary Guard–trained wardens, will administer requisite discipline to these women daily consistent with the severity of their deception. They will face immediate removal to the manual labor camp in our office’s sublevels should they not fully denounce their allegations as the mere fabrications they are. Each woman will appear in a video recording, which we will distribute to all media outlets, formally recanting her fictitious claims and personally apologizing to Mr. Trump for the suffering she has caused him. If the potential for escape is a reason for concern, Mr. Trump, rest assured that The Onion has operated private correctional facilities since the Spanish-American War, when we successfully detained the most violent and wily of Spaniards, and not a single prison break has ever been successfully orchestrated from our confines. 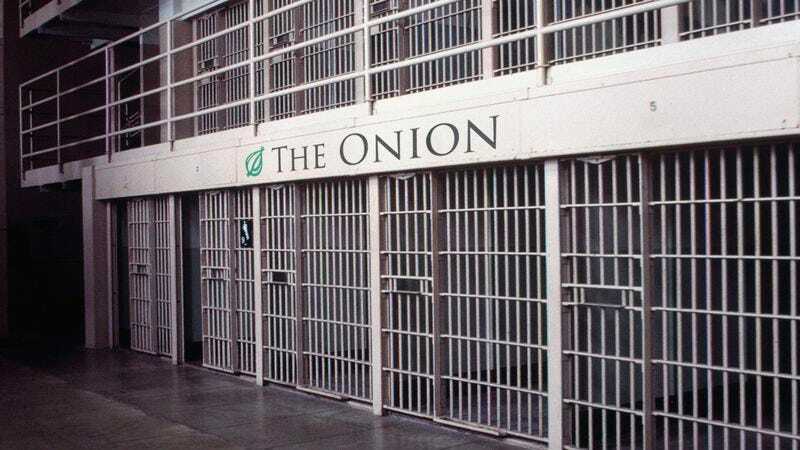 For more than 100 years, The Onion’s prisons have held the most cunning inmates, ranging from French traitor Alfred Dreyfus, to the seditious operatives exposed by Sen. Joseph McCarthy, to Salman Rushdie. We would warmly welcome the addition of these women who have so contemptibly borne false witness against a political standard-bearer and American icon. Indeed, even if Mr. Trump did commit an act or two of those which he has been accused, shouldn’t his immense prestige give him license to make a mistake here or there without it tarnishing his character and jeopardizing his chances at elected office? We most certainly believe so. It is The Onion’s firm conviction that in order for civility in our republic to endure, those seeking to lead the people must be freed from fear of scurrilous aspersions that threaten the very governance of our nation. Only through vigilant prosecution and punishment of those responsible for impugning Donald J. Trump’s character can we secure this noble aim. Anything less would be a dishonor to the very tenets upon which this newspaper was founded. Mr. Trump, we await your permission to incarcerate these deceitful women. It would be our distinct privilege.